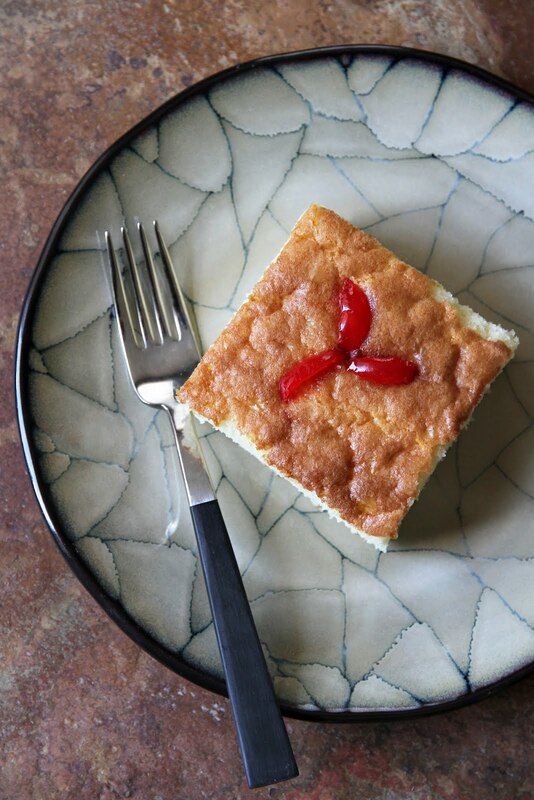 Here’s the plan: I’m going to shamelessly romanticize a cake in this post. I’m going to say that a cake is not always just a cake – as in the culmination of flour, butter, eggs, and sugar – but that a cake can be more than just a cake. I’m going to tell you about one particular cake and how it’s not just a cake but something meaningful enough to change someone’s direction in life. Then I’m going to turn around and tell you that this is a cake that, after all is said and done, is a delicious cake. Please let me take you to a lesser known corner of Bangkok whence this cake comes while you’re trying to grasp the gibberish profundity that is the previous paragraph. Here, gimme your hand. You look a little discombobulated. I could be writing one blog post a day for the next ten years focusing on nothing but the food of my hometown, Bangkok, and I am convinced that at the end I still won’t come anywhere close to running out of things to say. For every story I tell you, there will be at least two related stories brewing and bubbling in my head. And in the course of studying one thing deeply enough to be able to share my findings with you, I know a few new discoveries are waiting to be made. Bangkok is an endless book that keeps you on your toes. Just when I think I know the story, new things pop up, forcing me to go back a few pages – or chapters – looking for missed clues. The community around Suan Phlu Masjid (มัสยิดสวนพลู) in Thon Buri is one of the clues I had missed all these years. Had it not been for a writing assignment for a publication, I doubt I would’ve found myself on Soi Thoet Thai 19, a ridiculously narrow, barely navigable, can’t-even-bribe-a-cabbie-to-enter street where I’d never been my whole life. Running parallel to a train track and lined with wooden houses behind corrugated metal fences and patches of unruly swamp plants, this is not exactly a street meant for leisure strolls. Yet, strangely, I felt right at home. It could be because the people were so nice to me. I must have been emitting the disoriented stray dog vibes that belied my tough city girl’s face for every passerby seemed to know that I wasn’t from the area and offered directions even before I asked for them. Good thing everyone knew the small home bakery I was looking for. All I had to say was, “Badin cake” (“ขนมบดิน”) and all hands pointed in one direction. Mariyah Bakery (มารียะห์เบเกอรี่) doesn’t look like much. It’s a nondescript house that I could have easily walked right past had it not been for the fragrance of freshly baked cakes that wafted through the air. The set-up was also basic: trays of golden-colored cakes were set out on a large table right out front. A few auxiliary products in cellophane bags were kept in a glass display case. As Mariyah Yokyorkhun, the owner of this bakery, was chatting with me, her husband stayed close by, helping, setting up the shop, greeting customers. What a beautiful couple. Though a part of me tried to stay neutral, another part of me already liked my interviewee before I sat down. Then, about 40 years ago, Mariyah’s mother came up with what she believed to be a unique version of this cake, employing a brand of imported clarified butter that, according to Mariyah, had been used within the Muslim community exclusively in savory dishes prior to that point. The cake became a hit among members of the community, and a bakery was born. “This is all my mother had,” said Mariyah of the cake. “This cake kept us housed and fed and put me through school – it was all we had and she passed on to me this inheritance.” And with that, I knew this story had no chance of being objective. Though growing up with it, Mariyah had never planned on taking over the bakery. That is until she was about to finish her journalism program in college when her mother passed away. After some reflection, the young woman made a decision not to pursue a career in television and broadcasting and take over her mother’s bakery instead. It was a tough decision that, after two decades, is now starting to pay off. The bakery has in recent years been getting the attention of the Thai media and seen a steady increase in sales. Back in her mother’s time, though the cake had attracted enough regular customers in the area, the business could hardly be called a success. “Mom worked hard every day but never knew what it’s like to see our bakery grow and succeed,” said Mariyah. That’s changing. People are on to the delightful little secret of this obscure nook of Bangkok now. The bakery is still small in size and Mariyah has no immediate plan to expand it. “It’s a family business and we want to keep it real,” she said. “Quality control is easier that way.” Besides, both the bakery and Badin cake have been so deeply rooted in the community around the masjid that even the thought of having her flagship product mass-produced and sold at chain convenient stores around the city fills Mariyah with dread. But she hoped to grow; the direction just wasn’t clear. In the meantime, she enjoys waking up long before sunrise to make this cake just to do the same thing again the next morning. That was supposed to be the extent of my coverage on Badin cake: a cake that’s more than a cake, an interesting product by interesting people with an interesting story. Then I tasted that cake. And goodness gracious great balls of fire. The hearty texture. The strong buttery scent and taste. I knew I had to learn to make this delicious cake. 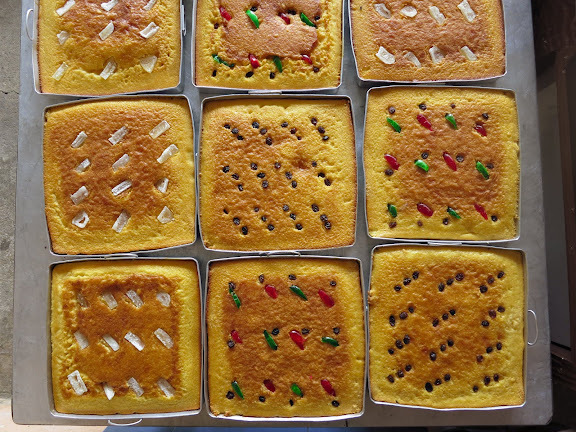 What purports to be the recipe for this cake as made by Mariyah Bakery was published in the 6th volume (no date of publication given) of a pocketbook series called Chong Thang Tham Kin (ช่องทางทำกิน). 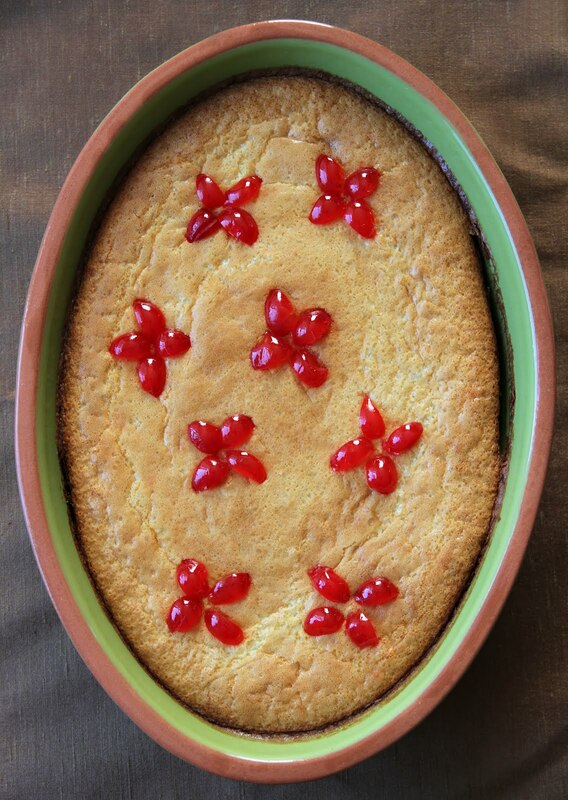 The recipe calls for one kilogram of flour, 25 eggs, 5 (14-ounce) cans of sweetened condensed milk, one kilogram of sugar, 400g of butter, and “a little bit of vegetable oil.” This ratio is supposed to yield about four 10×10-inch trays of Badin cake (pp. 50-51). I checked with Mariyah and she said that was just an approximate. “There’s much more to the process than the ingredient ratio,” she said, revealing — understandably — no further than that. Encouraged by some Thai-language blogs documenting their success with this formula, I tried making the cake according to that ingredient list (scaled down five times) and the procedure detailed in the previously-mentioned pocketbook throughout March 2012. By April 2012, after a series of pasty and dense cakes (see the pictures here and here), my trust in humanity lessened a bit. You could say I’m a bad baker who can’t follow instructions, but if my opinion means anything, I think something was amiss. Then I discovered this video clip which features Mariyah and her bakery on a Thai television show, Food Diary, and things became clearer. Though I’m still confused on a lot of things surrounding this cake, one thing became clear from this video: the recipe as printed in that pocketbook is — I knew it — missing one ingredient, evaporated milk. It makes me wonder how people could have had success replicating this cake using what is clearly a wrong recipe. Watch the video at 3:31. Canned evaporated milk is added to the batter after sweetened condensed milk. Mariyah stressed many times during her conversation with me that Badin cake isn’t like any other butter cake. The texture isn’t supposed to be light and fluffy. That’s why, according to her, no leavening agents are used. Nothing but a brief fermentation (if you can even call it that) is used to create a cake-like texture that’s not too dense or fluffy. The way they do it at the bakery is to start by beating the eggs and sugar with a machine just until the sugar dissolves. The egg mixture doesn’t need to have much air incorporated into it. Then everything is mixed by hand as you can see in the video above. After the batter is well mixed, it is left to ferment for 2-3 hours then baked. I don’t quite understand why, but that didn’t work for me at all. I tested this recipe at least 8 times and I failed every single time until I decided I needed to find my own way to recreate this cake. And I did. It involves some baking powder which has put a dent in my ego. But I don’t find the fermentation of the unleavened batter to be helpful in creating the desired texture. All it did was causing the surface of the cake to dome up unevenly in the oven and the texture to be almost as dense as almond paste. I came up with something that’s as close to the original as I possibly could. I’m very pleased with the result, but if anyone has a way of making the same thing without any leavening agent and using the method you see in the video, I’m all ears. Grease (and, if necessary, line with a piece of parchment paper) a 10-inch springform pan or a 9x13x2-inch pan; set aside. In a large mixing bowl whisk together the first seven ingredients until smooth. Whisk in all-purpose flour, making sure there are no lumps. You’ll have what seems like an abnormally thick batter. Fear not; it’ll be okay. Preheat the oven to 350 F. Position the rack in the middle. In another mixing bowl, beat eggs with an electric mixer on high until they are pale and gaining volume. Add sugar to the eggs a little at a time while continuing to beat. You know the egg mixture is ready when it has tripled the original volume and taken on a pale color; when dropped from the beaters onto itself, it will also form a slow ribbon-like shape. At this point, the disparity between the consistency of the flour mixture and that of the egg mixture is quite great, so in order to be able to mix the two together without deflating the egg mixture is to do it in gradually. Lighten up the flour mixture a bit first by folding in 1/3 of the egg mixture. This makes folding in the remaining 2/3 easier. Once the batter is well blended, pour it into the prepared pan. Tap the pan against the counter top a few times to get rid of air bubbles. Bake the cake for 30-40 minutes or until the top is golden brown and the center passes the toothpick test; remove the cake from the oven. 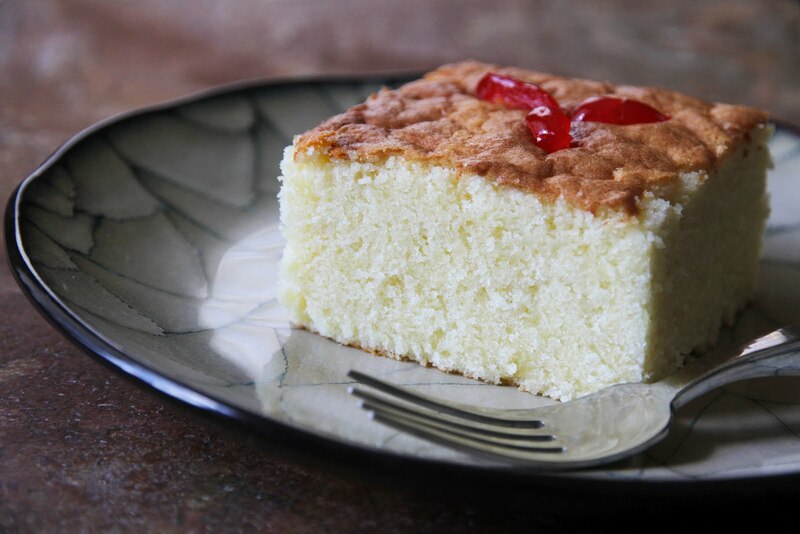 While the cake is still warm, press a few candied cherries or maraschino cherries into the top just deeply enough so that the top of the candied fruits are almost flush with the surface of the cake. Let the cake cool completely before serving or storing. Interesting that it’s so hard to reproduce this cake. I wonder if there’s another secret in the recipe that you haven’t discovered yet. Could it be the ambient temperature for the resting period? I notice you replace the evaporated milk with whole milk; assuming you tried it both ways, what was the difference? Love how this cake really is so much more than just a cake. Would be interesting to know more about its origins, which might also tell us more about the origins of the name. 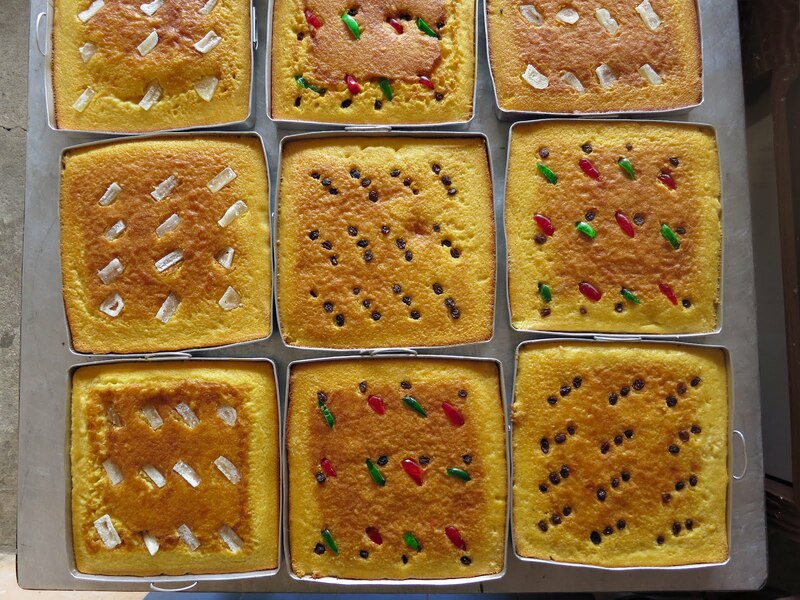 Hi, verygood featurei really appreciate your hardwork on featuring this unseen food.Here I egypt we have almost similardensed cake called basbousa, we use butter or ghee ,basbousaflour (grainy in texture)sugar, vanilla and plain yughort.Im going to try your recipe judging with the milk engredients its very delicious.one more thing, I think what makes it bubbly without leavening agent is the chemical reaction of mixed engredients and “human”chemicals being released during all the mixing:).thnx verymuch for sharing. Can I ask where (geographically) you left your batter to ferment, and if that perhaps has something to do with different success rates? After recently experimenting with a lot of cacao fermentation in Hawaii, Mexico, & Indonesia, I’m becoming acutely aware of how different natural airborne yeasts are in different regions, and how different those yeasts can be in their leavening power. If you were fermenting in Chicago, which even in summer is way cooler than Bangkok, the yeasts may ferment at different rates, and different species or varieties in Chicago or Bangkok may act totally differently on the batter, e.g. some can thrive on sugars in wheat & milk, while others cannot. For example, some fermenting & leavening bacteria like Lactobacilius sanfranciscensis has trouble surviving or doing its job outside it’s native San Francisco region. There could also be a sense of ambient sourdoughness, if you’ll excuse the convoluted wording, where in Mariyah’s shop where she’s making the Khanom Badin daily, she cultivates the right kind of yeast who can live as spores in the air in the short interstices between khanom badin batches. Whereas in your kitchen in Chicago, even if you got the right kind of yeast, where would they go in the long times between your khanom badin batches? Also just theories, but have you tried to make khanom badin in Bangkok? Can you ask Mariyah if she’s had any difficulty making it outside her shop, in another part of Bangkok or Thailand with different temps? 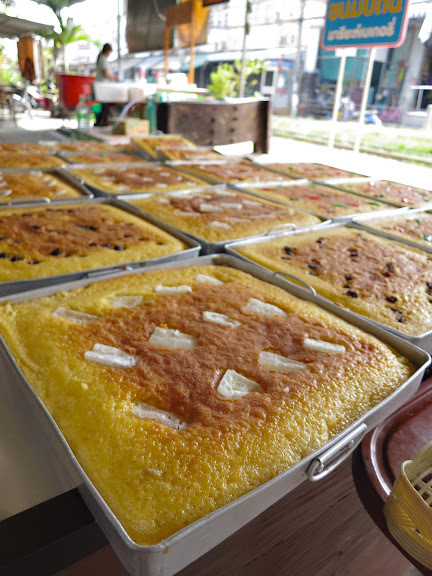 I need to experiment baking khanom badin in Bangkok to see if makes any difference. watching the video reminds me of a video i saw of sourdough bread making in france. the baker slapped the dough on his bare chest from time to time to pick up the natural yeasts present amongst his chest hair (ugh). the woman mixes the dough with her hands, same idea? I don’t bake often, but the next time I do this cake is on the list. Bookmarked! Similarity of the pictures and your description of its denseness are striking. I love your recipes. You have taught me new things that I did not know and I am Thai myself. Thank you! Wannee. What a fascinating post. At what stage is the cake fermented if not using the baking powder? I’m living in the tropics now (Singapore) and would like to give it a go to see if the temperature and humidity will make a difference? I’m finding that a lot of recipes I had previously baked in a temperate kitchen (Sydney), are turning out slightly different over here. shaz – Mariyah says she ferments the batter for 2-3 hours. The ambient temperature in Singapore shouldn’t be that different from that in Bangkok, so I think 2-3 hours should be okay. At the end of the fermentation, you will see some bubbles. But once you transfer the batter to the baking pan, they subside. I totally applaud yr dedication and commitment to “de-mystifying” the secret ingredients in this ‘heritage’ cake, that has such a beautiful story behind. I really think the issues with fermentation might be a difference in the local yeast flora. I spent *months* lovingly feeding and tending to a soughdough starter here in Pittsburgh. At the end of that time I was able to produce some wonderful bread but none of it had the sourness that makes san francisco sourghdough so spectacular. The starter and sponge would smell strongly of fermentation but it never carried through to the final product. Think of the wild yeast and bacteria as a very regional and very specific ingredient. I’m thoroughly enchanted… I love Thai food, and cooking as well. Your site helps me find my way to easier solutions!! Thank you so much!! I have to play here more frequently, because Thai food works so well in the heat of summer! Thank you for sharing so much!! This is a wonderful website and I thank you from the bottom of my heart. I live in Los Angeles and would love to taste this lovely cake. 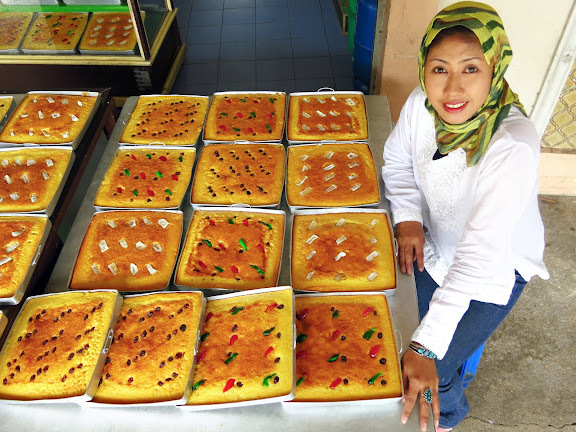 Where can I buy the Khanom Badin cake in the Los Angeles area? Anon of June 21 – Thank you. I don’t think you can find it in LA. This cake isn’t even common in Thailand. But you can make something close to it with this recipe! just went to Mariyah’s shop and bought a couple of Badin Cake. The address is actually Soi Thoet Thai 9, but don’t go to this soi cause it’s only a walking path, too narrow for a cab to drive thru. Her shop is just next to the railway track. It’s easier to go to drive to her house on the opposite side of the track, on the junction of Liap Thang Rotfai and Soi Rimthang Rotfai 5, near to Wongwian Yai Railway Station. Is there a number that I can call? It is different from yours and doesn’t have the evaporated milk either, but I thought it was interesting where it said to leave it for up to eight hours before baking. Did you try a longer rest time? If it is a dense cake it probable would have sat long for all of the air from the eggs to deflate enough to not collapse on baking (I haven’t tried myself, just some thoughts). I love your work! Kelsey – That appears to be a scaled down version of the recipe from the same book which, as shown in the video, doesn’t reflect the recipe actually used at the bakery. I did try fermenting the batter at room temp overnight; it failed too. So it could be, as others have suggested, that the wild yeasts in my area aren’t the same as those in Mariyah’s or that blogger’s areas. But you if you want to try that recipe and report back your result, I’d greatly appreciate it. Thank you! She hopes to do a lot more ploughing too.